Congrats to Audrey Daul with this year’s winning design! Audrey is responsible for starting the Algoma Rocks movement and rock paintings are among the most desirable to find! Always conscious of creating a happy, welcoming rock painting community, Audrey maintains the Algoma Rocks Facebook Group and introduces new people to the hobby of finding rocks or painting them selves. Thank you to Audrey for a great design! In addition to Audrey’s design, there is also a general Shanty Days shirt and all are now on sale at the Algoma Visitor Center and will also be available at the Chamber booth on the Main Grounds during Shanty Days weekend. 2018 marks the 32nd Shanty Days Celebration of the Lake and will take place here in Algoma, WI August 10-12, 2018. This year’s theme is “Algoma Rocks at Living Well” as a nod to the rock painting phenom that hit our town last year and the incredible award for community health given by the Robert Wood Johnson Foundation. The Algoma Area Chamber of Commerce Shanty Days Committee is pleased to announce the Shanty Days 2018 shirt design contest. The contest is open to the public and to all ages. 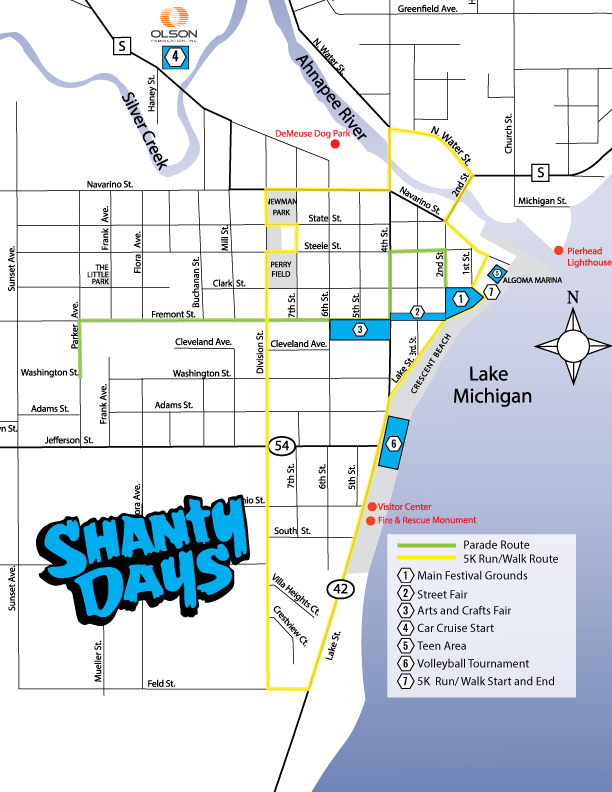 We encourage everyone to participate and perhaps become part of Shanty Days history. The design should be created ‘shirt-size’, no larger than 12 x 12 inches and limited to three colors. The design need not reference any particular theme. Deadline for entry is April 27, 2018. Electronic entries are preferred and should be emailed to info@algomachamber.org. Mailed and dropped off entries must not be folded. The winner(s) will be chosen by the Shanty Days Committee and will receive a free shirt and two Main Grounds entry wristbands. The winning design(s) will be credited on the shirts and may be used in future Shanty Days promotional materials. The Shanty Days Committee looks forward to seeing all the entries. For more information on the contest, please contact the Algoma Area Chamber of Commerce at (920) 487-2041 or info@algomachamber.org.